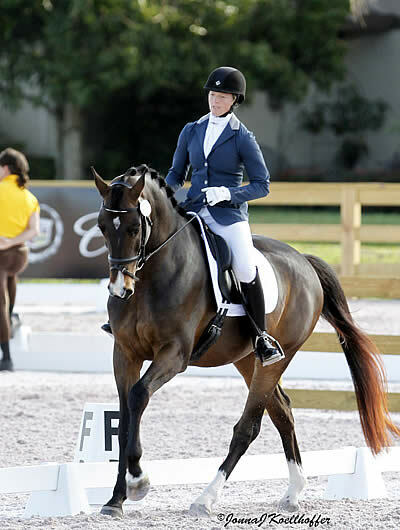 Wellington, FL – March 8, 2012 – Alix Szepesi of Hamilton, MA took top honors on Tuesday, March 6, the first day of the Global Dressage Festival National Challenge. Szepesi, who is currently based in Wellington, rode William to an outstanding score 77.432% in the USEF First Level Test 2-Open at the Stadium show grounds of the Global Dressage Festival (GDF). Susanne Dutt-Roth of Canada also scored well earning 77.000% in the USEF Fourth Level Test 1-Open riding D2. The GDF National Challenge was only the second show for the eight-year-old warmblood. 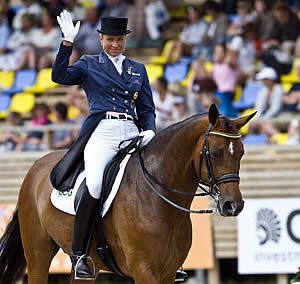 The Global Dressage Festival also welcomed their first Para-Equestrian competitor, Jody Schloss, 39, of Toronto, Canada. Schloss scored impressively in both of her classes on Tuesday riding Inspector Rebus. The pair received 74.118% in the FEI Para Test of Choice and 75.500% in the FEI Para Freestyle Test of Choice. Anja Plönzke of Germany is atop the latest Nurnberger World Dressage Masters Rider Rankings after the first two of five CDI5* events on the 2010-11 lineup in which Nurnberger Versicherungsgruppe awards €25,000 (US$31,800) to the winner. So far this year in the events which count toward the award, the finished 2nd in the Grand Prix and 3rd in the Grand Prix Special at Cannes, France and 3rd in the Grand Prix in mid-June and 4th in the Grand Prix Freestyle at Falsterbo, Sweden last week. Her results accumulated 1,090.5 points, with Poland’s Michal Rapcewicz in second place on 855 points and Anky van Grunsven of The Netherlands in third place with 765 points.